Virginia Gov. 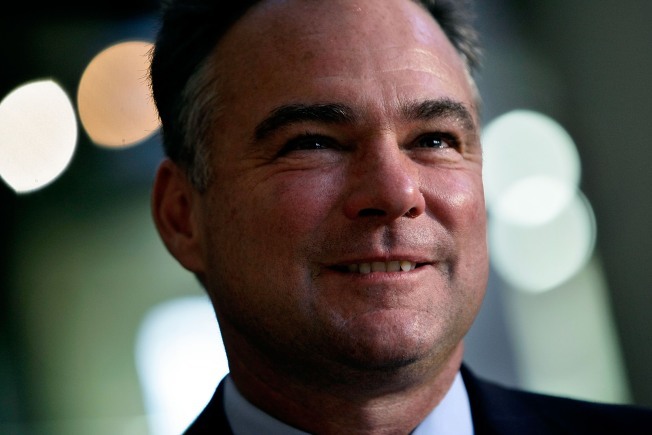 Tim Kaine will head the donkey party part-time until his governorship runs out in 2010. President-elect Barack Obama has selected Virginia Gov. Tim Kaine as the next chairman of the Democratic National Committee, two Democrats said Sunday. Kaine plans to work at the party part-time until 2010, when his term as governor is up and he can take over the DNC full-time. Current DNC chairman Howard Dean plans to step down Jan. 21, the day after Obama's inauguration. Obama has also chosen Jennifer O'Malley Dillon, who directed his successful campaign battleground state strategy, to run day-to-day operations at the party as executive director. With Democrats controlling the White House and Congress, the new DNC chairman will be responsible for reinforcing the White House message, preparing for the 2010 midterm elections and raising money. The Republican National Committee is set to decide in the coming weeks between six candidates for chairman, including current head Mike Duncan, who is running for re-election. The new RNC head will be expected to take the lead in responding to the Democratic administration as well as rebuilding a party left in tatters after sweeping defeats in two straight elections. Kaine campaigned vigorously for Obama in Virginia during his presidential run. The day after the election, Kaine said Obama's triumph in the state — the first for a Democrat seeking the presidency in 44 years — was the apex of everything he had worked for since law school. Kaine was mentioned as a possible running mate after Obama clinched the Democratic presidential nomination; Delaware Sen. Joe Biden eventually won that spot. After the election, Kaine was mentioned as a potential choice to serve as education secretary; Obama instead chose Chicago schools superintendent Arne Duncan. In November, Kaine said he wasn't interested in the DNC job. He won election to the Virginia governor's office in 2005. In January 2006, he was chosen to deliver the Democratic response to President George W. Bush's State of the Union address. Virginia law prohibits an incumbent governor from running for re-election. A former DNC chairman, Terry McAuliffe, said Saturday he intends to run for governor of Virginia. In a video posted on his Web site, McAuliffe said he will make his intention to run official on Wednesday as part of a weeklong campaign kickoff. McAuliffe faces two other Democrats who have been active for nearly a year in an already contentious nomination fight to succeed Kaine. State Sen. Creigh Deeds narrowly lost the attorney general's race in 2005, and former House Democratic Caucus chairman Brian Moran is also in the race. The Democratic nominee will face Republican Attorney General Bob McDonnell, who is unchallenged for his party's nomination, in the Nov. 3 election.